Gaurang wants to know what is the process for getting a loan from a Microfinance Institution. Radha wonders why nearly one month since her application for a loan it hasn’t come through, while Komal asks why, when she applied for a loan for 50,000 rupees, she only got 35,000. The Microfinance Institutions (MFIs) sector in India has evolved since its early days as solely not for profit with a strong social focus, to have organisations that are now finance companies in their own right. Strongly supported by the government for their role in serving hitherto-unreached bottom of the pyramid rural consumers, many for-profit MFIs today are recognised as Non-Banking Finance Corporations (NBFCs). MFIs have gone through their share of ups and downs over the last year. Demonetisation is said to have had an impact on borrowers’ ability to repay loans and loans and sector growth has slowed down even as business has grown in the first quarter of FY 2017-18 compared to the same period last year. While several macroeconomic factors have a role in this scenario, what this – and the questions from Guarang, Radha and Komal quoted above – demonstrates is the need for regular engagement with their clients to clarify doubts, hear grievances and pass on information about products and how they work. This engagement is critical to ensuring clients know what they are getting into, and can do their best to repay their loans, but also for MFIs to understand their clients, their needs and motivations better. Could technology play a role in facilitating this engagement? Punji ki Kunji, available on the number +91 92505 00111, is an opportunity for this engagement to happen between MFIs and their clients at no cost to the client. Punji ki Kunji was started as a pilot in collaboration with Small Industries Development Bank of India (SIDBI) and Sa-Dhan, an association of organisations that provide community development financing, including for-profit and non-profit MFIs and Non Banking Financial Corporations (NBFCs). In June-July this year, 5,000 people from Bihar made over 30,000 calls to Punji ki Kunji to learn about their rights as customers of Microfinance Institutions (MFIs) and how loans from MFIs work, and to share their experiences and grievances in accessing or borrowing from MFIs. The collaboration between Mobile Vaani and Sa-Dhan began with field visits in Hazaribagh and Patna to understand community perceptions of what they want to know about taking loans from MFIs and what support they required. The field visits showed the need for deeper engagement with people in rural India. Potential and current clients often did not know how their loans and repayments worked, their rights and responsibilities as clients of MFIs, as well as their role and responsibilities in a Joint Liability Group (JLG). 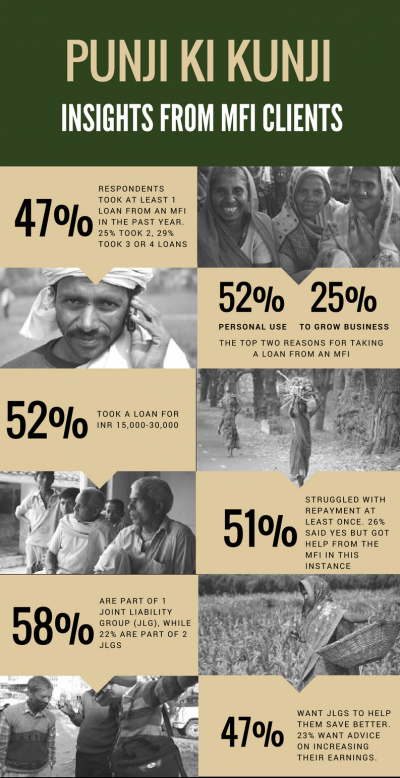 Additionally, field research showed that the clients felt their relationship with MFIs could be more than simply giving them loans in times of need. In a nutshell, our field interactions showed that there was space for information exchange between MFIs and clients, for education about loans and repayments – we had the potential to strengthen awareness of clients regarding MFIs and create a difference in the lives of borrowers and their families. Based on these insights, Mobile Vaani decided to develop and pilot Punji ki Kunji with an MFI as partner in Muzaffarpur, Bihar, where the MFI has a substantial client base and a significant number of branch offices. Initiating this service required substantial groundwork: we had to work with MFI officers stationed in the district to train them on the service so that they could spread the word among their clients about it and encourage them to take the surveys to collect information about their experiences. In a pilot in June-July 2017, close to 30,000 calls were received in the Muzaffarpur district from 5,000 callers. Each caller, on an average, called back on the number six times, indicating that they were keen to come back to Punji ki Kunji for more information. Here are some highlights from the two surveys taken on the platform, one gauging client satisfaction with MFIs (345 completed responses) and another on clients’ experiences being part of JLGs (255 completed responses). These results have the potential to spur ideas for MFIs to consider how they can strengthen their work with their clients for a long lasting and mutually beneficial relationship. It also offers an opportunity for success stories from clients to be featured on the platform, giving more prospective clients information and feedback on the MFI. Additionally, the insights help Sa-Dhan as a Self-Regulating Organisation stay on top of client satisfaction, issues management and the general health of the MFI industry in the districts that are being surveyed. The success of the pilot has spurred Mobile Vaani to collaborate with Sa-Dhan on taking this service to more districts that have a high concentration of MFIs that are Sa-Dhan’s partners. Our plans are to go to Bihar, Madhya Pradesh, and Uttar Pradesh, although we are keen to work with Sa-Dhan partners from other states too, who may wish to roll out Punji ki Kunji in their priority areas. We will conduct workshops with MFI managers there and conduct community interactions required to encourage more and more people to call in on Punji ki Kunji. Supporting us will be Sa-Dhan’s team, organising orientation sessions in these states. We will also roll it out in Mobile Vaani local clubs and our Bihar and Madhya Pradesh services. We are currently promoting the service with MFIs working in these regions to encourage them to connect with their clients and gain insights for a mutually beneficial relationship. Gram Vaani’s Mobile Vaani service has several years’ experience in communicating with people who live in media-dark areas, and gathering research, insights, grievances and requirements from these under-served communities. For more information about our research and data collection capabilities, visit here. Write to us at contact@gramvaani.org if you would like to know more.